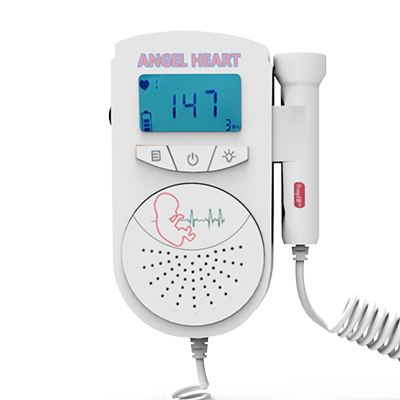 Categories: First Aid Kit, TempIR Products Tags: arm blood pressure monitor, automatic blood pressure monitor, best blood pressure monitor, high blood pressure monitor, large arm blood pressure monitor, reasons for high blood pressure Brand: TempIR. Accidents are accidents and can happen at any place, anytime to anyone. Despite all care and alacrity, they are part and parcel of everyone’s life, and we all have gone through it. Thankfully, most of them are minor in nature and can be tended by first aid only. First Aid is the instant medical assistance provided for relief to the injured person who has suffered a bodily injury. As the old saying goes, a stitch in time saves nine, is very apt in First Aid help. There are ample every day experiences which suggest that proper and timely help to the injured person has averted crisis and proven to be life-saving at times. 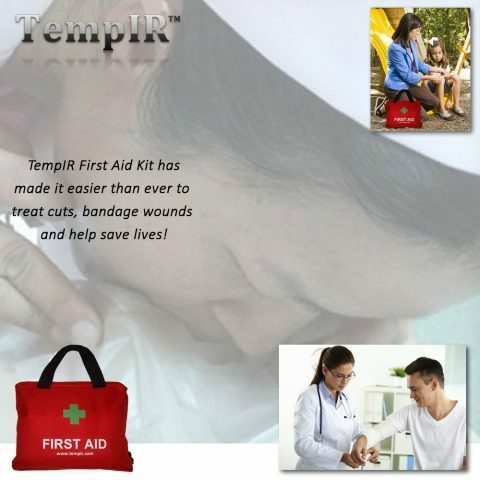 Every household or workplace usually has some assorted items like Band-Aids, Crepe bandages, antiseptic solutions, etc. in a tiny box. Children are always prone to suffer from minor cuts or injuries during their sporting activities, and the first aid is often needed to take care of these injuries. Most families carry them in their cars or caravans when they plan an excursion trip to have some first aid measures in case of any unfortunate accident. 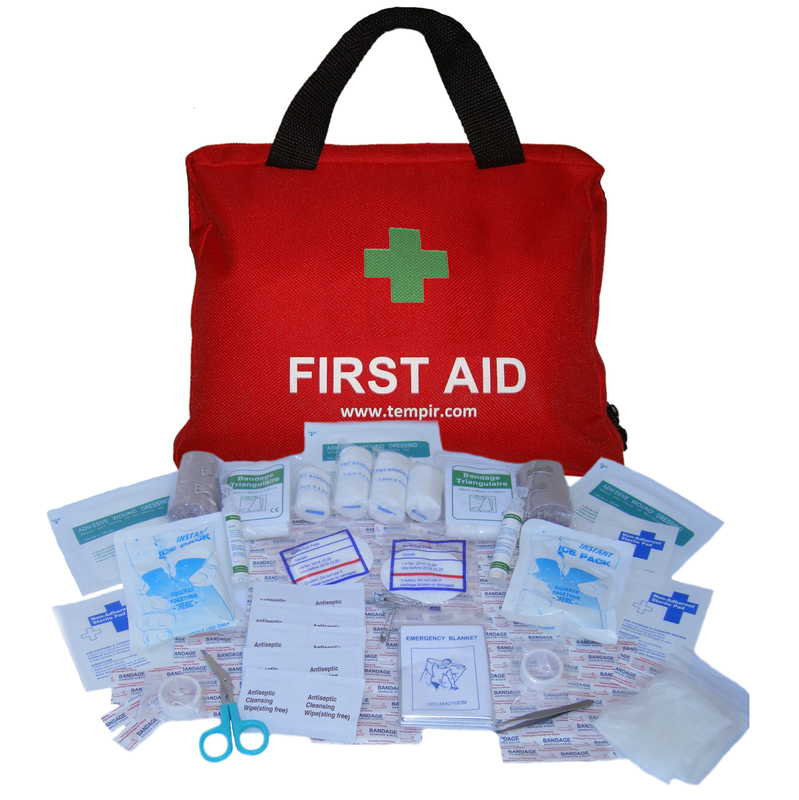 There are many ready-to-use First Aid Kits available in the marketplace or over online stores. Temp IR First Aid Kits are probably the first of its kind affordable kit which has been diligently assembled with quality medical supplies to take care of minor injuries that we encounter in our daily routine. 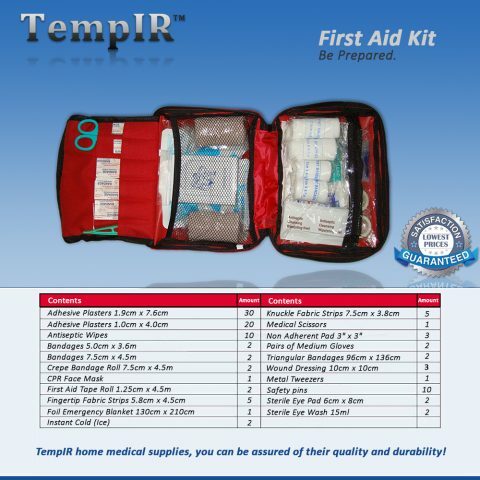 The kit comprises of 100+ items which are neatly arranged in the compact double zipped red fabric sturdy case which has thoughtfully designed elastic slip pockets and PVC pockets to contain secure the ingredients. The antiseptic wipes, bandages of different types, crepe bandages, wound bandages, adhesive bandages, fabric strips etc are neatly packed in the kit with a pair of glove and scissors to hygienically provide the first aid to the injured. Eyes are one of the most delicate organs of our body and prone to injury. 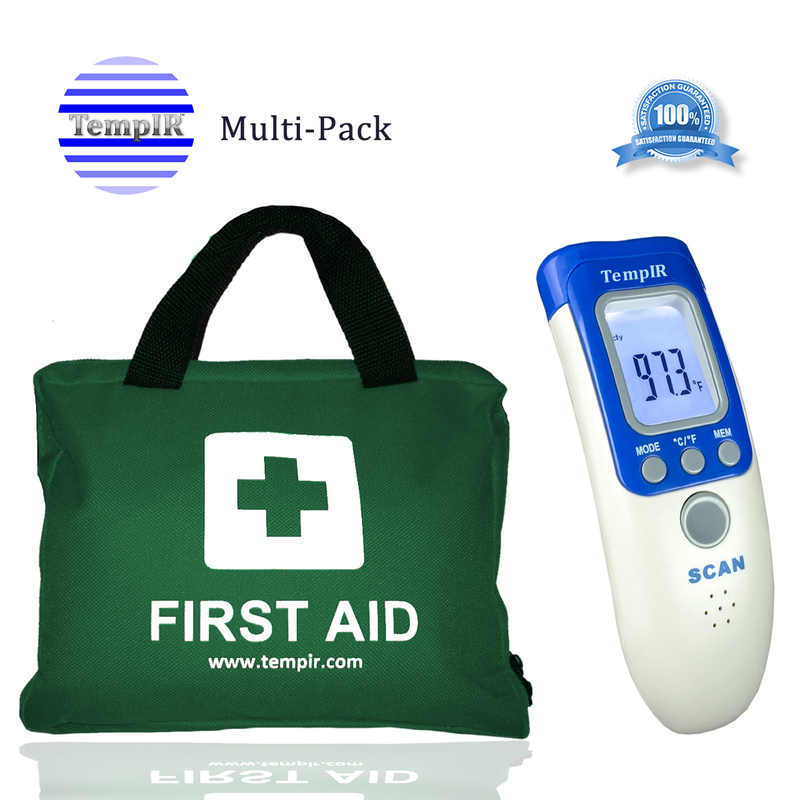 The kit contains sterile eye wash and eye pad to provide initial relief to any accidental injury to the eye. This is very handy since most kits overlook quality eye care aid items which are of extreme importance at the times of need. 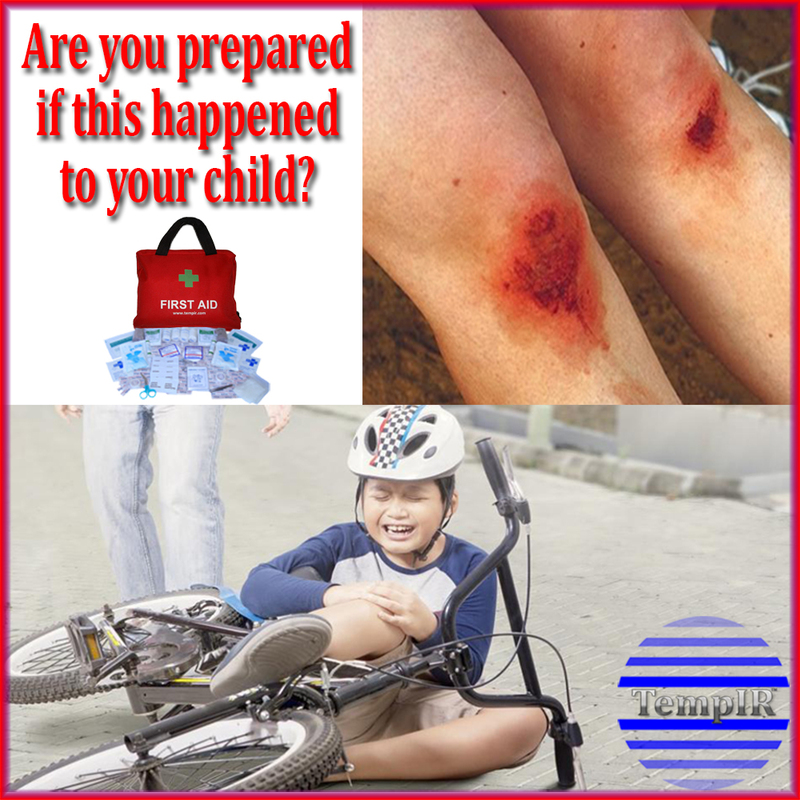 Similarly, Ice packs in the kit can be extremely useful in providing immediate relief from sprains during sports or adventure activities. The CPR included in its First Aid kit makes the kit precious when you have to confront extreme situations where somebody has suffered drowning or suffocation or even a heart attack. While First Aid training is usually provided in schools or camps to apprise us of its importance and use; the informative booklet on first aid applications is the helpful guide in refurbishing the important information. 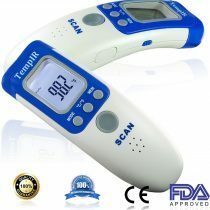 Temp IR is already an established name in the field of sophisticated medical instruments like infrared thermometers, Finger pulse oximeter, etc and they have meticulously assembled this useful and compact First Aid Kit with CE approval and top quality medical accessories. The kit comes at affordable price range with money back guarantee. This first aid kit really appealed to the magpie in me! It has everything you could need from bandages, plasters, eye wash (and an eye wash cup) scissors, tape, gloves and the list goes on. I got a – quite frankly, embarrassing – amount of pleasure from looking through it when it arrived! I have two small children who are always getting into scrapes and this will be ideal for keeping in the boot of the car for all the little emergencies we have – and we have a lot! As a trained paramedic I’m always a bit cynical of these pre-prepared first aid kits as I have found that they always fall well short of the minimum required equipment. And so I’ve usually bought a bag and then made up my own first aid kit from my personal experience. As we have a young toddler we decided that we needed a kit in the car as well as at home and so we looked on Amazon for a bag and supplies. My wife drew my attention to this kit from TempIR as it was not only a bag but listed pretty much all of the equipment I thought that we’d need. I thought why not buy this one as it was very well priced and worst case I can replace and enhance as required. The kit was delivered very quickly and came well protected and packaged. First impressions were great bag, generously sized, nice carry handles. When I opened it I was really pleasantly surprised, not only did it have everything I needed and to the quality and preparation I would expect, it was very well organised and with the inner sections in an emergency it would make it easier to use and we all know that minutes save lives! Thoroughly recommend, very happy and as a result of this I bough another product from this company too, equally impressed. 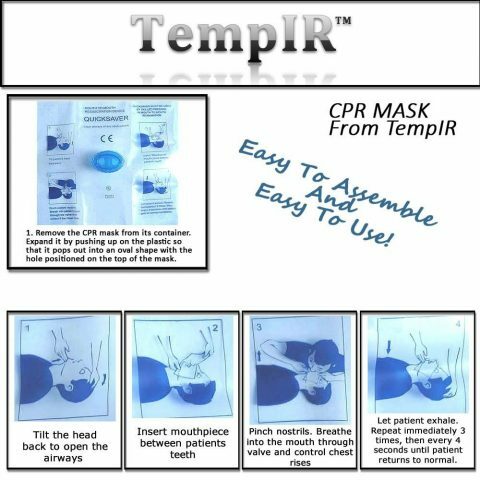 The Emergency Blanket and CPR Mask are a great addition and as a trained nurse unfortunately have dealt with two incidents where they would have been extremely useful(out of work ,in my own time and left on my own with the situation)until the Emergency services arrived. I Like the compression bandages with metal fastening clips ,the adhesive tape and the array of different sized plasters plus the ice packs. 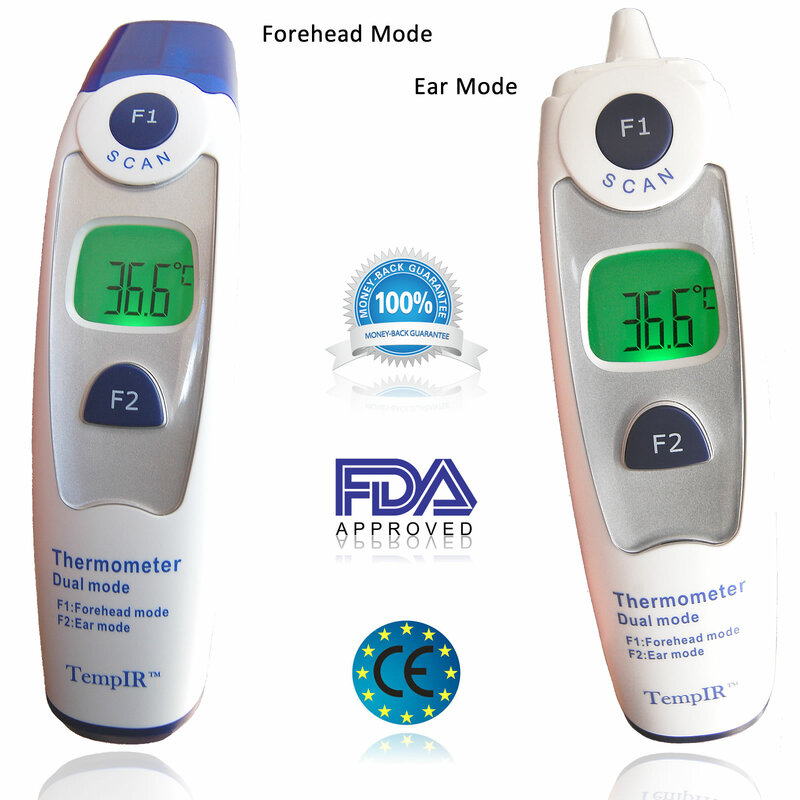 This is ideal to keep in the car when travelling,or for home or work use use. I.received this item in exchange for an honest review which has not influenced my opinion whatsoever. Smaller than I imagined it but everything is there. The small size of the pack means that it will fit in one of the many storage spaces in the car. Very good value for money. Hopefully I will not need to use it, but I feel confident that it will meet any needs that I may have. I’m considering getting some more as Christmas presents for the rest of the family. This first aid kit is the all round champion! With over 100 pieces, you are covered for pretty much any minor injury caused by a small accident. Our family is full of fun loving maniacs consisting of humans and 3 two month old kittens so scratches, bumps, injuries, sores etc are a common thing! 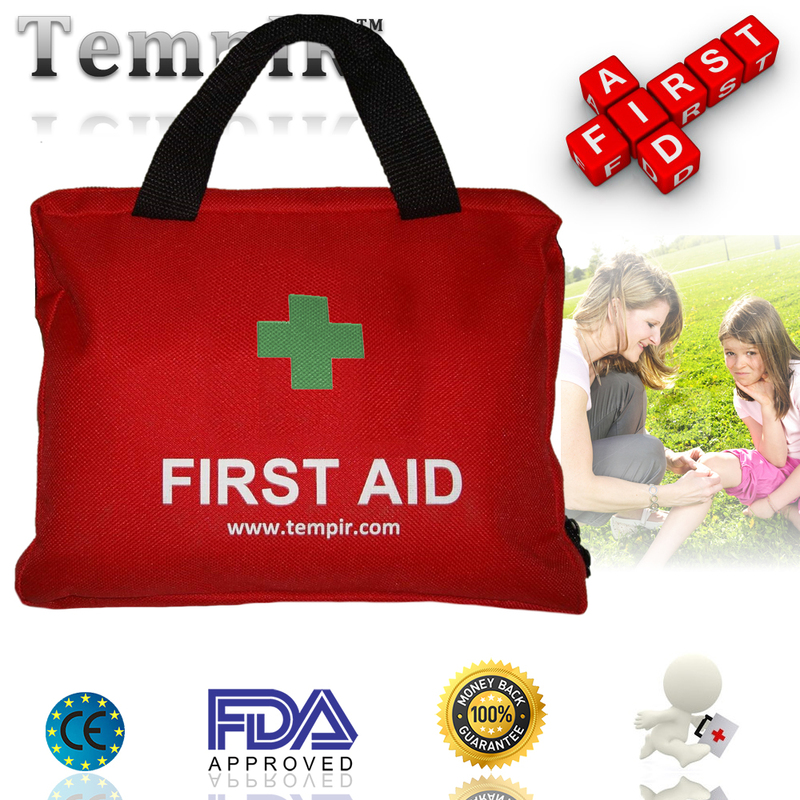 This first aid bag has everything you would need when the emergency strikes. – It’s ultra small and very portable – easy to carry and store anywhere. I would recommend other this product definitely. 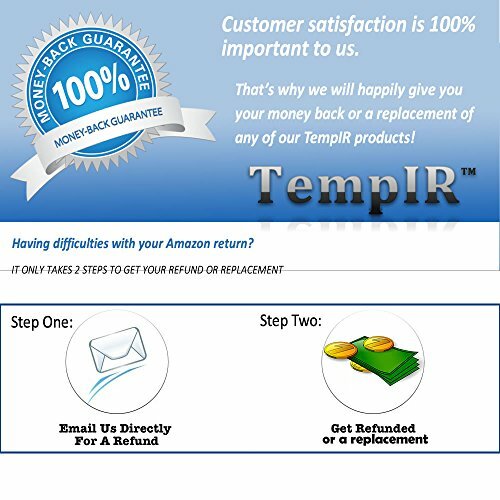 Good product and had to make contact over a query and the customer service was absolutely excellent. Ok I love this first aid kit! I bought it to fill up certain supplies I needed in my EMT bag. I love how it had two of a lot of items. Most first aid kits only have 1 of everything. This was very helpful because it was an affordable kit and I didn’t have buy everything seperately. Very happy with the product. It has got everything you need to have in a first aid box. It’s easy to carry around. It is light. Just wondered whether you can order items to refill the bag once you have used some of them. I have always been skeptical of most products of this sort, I guess the military will do that. 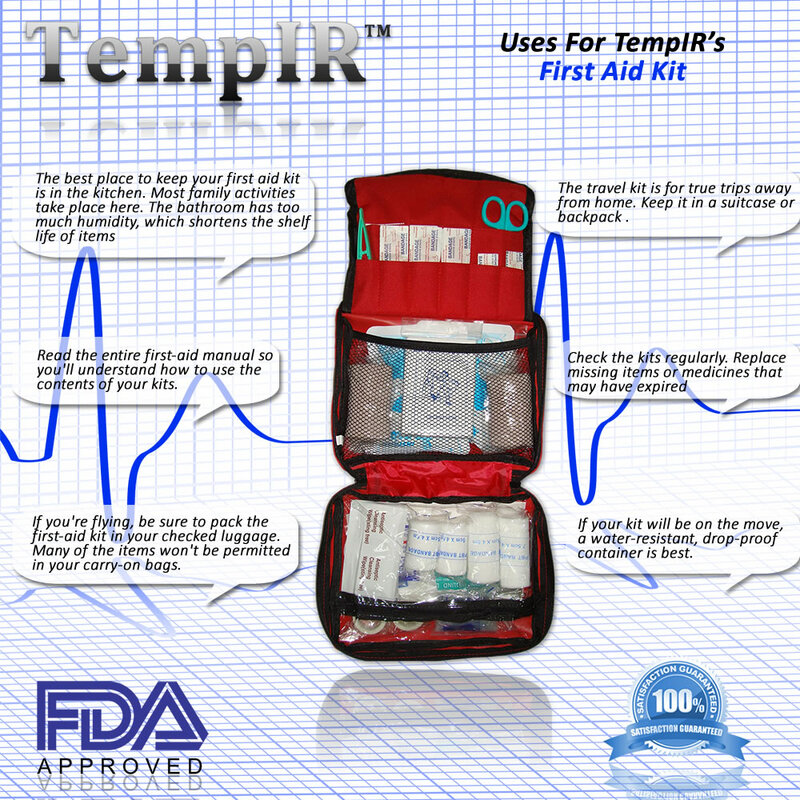 But this is one of the very best kits that I have seen on the market, and I recommend this product to any and all folks looking for a first aid kit. Career military and I think these guys got it right. Small enough for home or car, have more than enough of what I need. Great price and fast shipping. I just took a First Aid, CPR and AED class and wanted to find a First-Aid kit the contained some of the essentials talked about in class. This little bag seems to fit the bill! i wanted something portable as well for car-trips and camping. This is a great kit for an excellent price! Bought one for home and one for the cub scout pack. The first aid kit is great. Exactly as described and arrived in reasonable time!